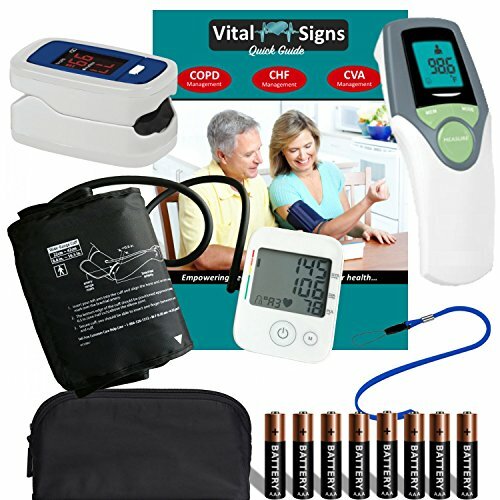 The Most Advanced and Complete (Newly Upgraded) Home Health Vital Signs Monitor Kit. Doctor and pharmacist recommended machine. Clinically accurate readings. Irregular heartbeat detection. Hypertension indicator. Large LCD display. Fully automatic inflation and deflation. 2-person memory bank with date/time stamped memory recall. Average of last 3 readings for each user. Suitable for sports and fitness enthusiasts. Originally designed for sports and/or aviation use only. Calibrated for accurate readings an industry standard. Automatic power off after inactivity. Includes strap for easy portability. Safely & quickly check temperatures of the body, room, object, milk, food, bath water, etc. Great tool for all ages -- from baby care to elderly care. Uses newest infra-red detection technology for accuracy and reliability. Switch from Celsius to Fahrenheit. Store up to 120 memories. You can set alarm to go off at abnormal temperature points basing on the included guide. BP MONITOR - Best blood pressure cuff and bp monitor. Calibrated with blood pressure testers to assure accurate measurement with irregular heartbeat detection, helpful for monitoring atrial fibrillation (afib). Wide range cuff fits small to large arms and automatically inflates with one touch on/off button. Stores up to 120 readings for two persons (60 each) and shows average of previous readings for each user. Comes with 4 AAA batteries. PULSE OXIMETER - Originally designed for sports and/or aviation use only. Upgraded bright digital display great for people with low vision. Highly recommended finger SPO2 oxygen saturation pulse ox meter. Also suitable for sports and fitness enthusiasts. Automatic power off after inactivity. Portable - includes strap. Comes with 2 AAA batteries. THERMOMETER - No touch thermometer infrared technology gives precise temperature readings of both adults and babies or children without making them uncomfortable. Best home temporal thermometer. Displays calibrated body temp levels in seconds and auto power off to save battery. Accurately scans temperature of body, food, liquids, room and other objects and surfaces from 2-5 inches away. Switch between Fahrenheit and Celsius. Comes with 2 AAA batteries. VITAL SIGNS GUIDE BOOK - with COPD CHF CVA Stroke Management Charts, Vital Signs Log pages to record readings and show your doctor, and Low Sodium Nutrition Guide for eating at home or when eating out (Fast Food Picks). COMPLETE HEALTH KIT - Comes with English and Spanish Manuals, and Quick Start step by step guide for each device, charts for management of copd congestive heart failure & stroke - all in a gift ready storage box. Great gift for all occasions. If you have any questions about this product by Multi-Brand Bundle, contact us by completing and submitting the form below. If you are looking for a specif part number, please include it with your message.